Can it really be that the clocks have changed, eager little eyes are keeping a look out for the Easter Bunny and the promise of some warmer Spring weather is just around the corner?! They say that time flies when you are busy and having fun, and that is certainly the case here in the MyLiferaft office! 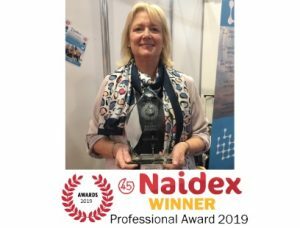 We were thrilled to be awarded the Naidex 2019 Professional Award last month which ‘credits the innovation that has made an immeasurable contribution towards the healthcare profession both now and into the future’. This award has really put a ‘spring’ in our step as we continue to work to develop even more improvements to our product. For all parents, grandparents and carers of children, we are all hoping for some sunny days over the next few weeks as there are only so many rainy days we can manage with a glue stick, paints, spare toilet rolls and glitter! Don’t forget you can use our online Resources to help you with ideas and suggestions for activities in all weathers! At this time of year, there are Easter egg hunts being organised both nationally and locally, however you could always organise your own hunt either indoors or outdoors come rain or shine! Undoubtedly, being a parent carer is a challenging role. From the day-to-day care at home to juggling numerous medical appointments, usually with the added pressure of looking after other children – it can be tough, and it is not surprising that many parent carers feel they’re alone. However, here at MyLiferaft, we know first-hand that being a parent carer is also an extremely rewarding role. Seeing the care you give to a loved one and the positive impact on their quality of life, no matter how big or small it may seem, is priceless. We also know it can be difficult to feel this way at times, when it feels like nothing is going your way. Using our own experiences and in talking to our community (including other parent carers as well as those that are managing their own care and well-being), we’ve put together a comprehensive list of Resources that can be found on our website. There are over 55 different subjects include including Bullying, Going Back to School, Bereavement, Dementia, Epilepsy, Mental Health, Benefit information, Autism and various NHS information websites. We hope that in having this list available 24/7, you feel that there is support available to you and your family. We are loving the interaction on social media at the moment, so a big THANK YOU to all of our followers across Twitter, Facebook and Linked In. 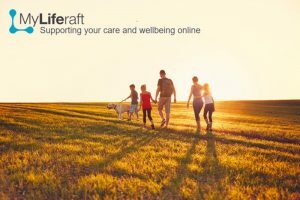 As well as informing our community on how MyLiferaft can help support you and those you love and care for, we also want to pass on stories, information and other support networks that we think you would find interesting and useful. Do let us know if there is a story you think we should know about or that we should share. To support those with dementia we have recently added an area for capturing your Life Story, which you can then share with carers to ensure they understand you and your memories. We have had feedback that some of you may have had your ‘Welcome to MyLiferaft’ e-mail go into your junk box. If you registered for an account and have not had an e-mail back that needs you to confirm registration, please check your junk e-mail, or contact us. The team and myself are very excited as we ‘spring’ into the next few months and we continue to work for and with our community of users.